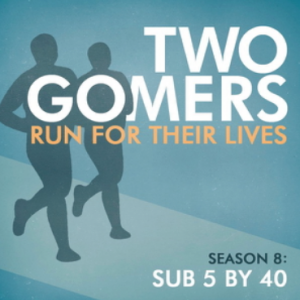 Season 2: Gomer Group Run Reminder! Just a quick reminder to join us in one week, July 24th, for our 1st Annual “How’s It Goin'” Gomer 5k Group Run! If you can make it, please head over to our Facebook event RIGHT NOW and let us know! All the details are there, so click here ASAP so we know how many to expect! Mr.s and Mrs.s Gomers will all be in attendance! We’d love to hear if you are running “virtually” too – at the same time and for the same distance, but in your own area. There’s a way to let us know about that on the FB event as well. Check out this short little podcast to hear some details, or just to get the Gomer fix you might be needing. Happy Running! Good to hear from you guys. I’m going to be moving the weekend of the run, unfortunately (seriously), so I will have to do my virtual run later. But I’m keeping up with my gym plans! Have a great time and eat some Culvers for me. Going to be doing an 11 miler in prep for my 2nd 1/2 marathon this Summer. Pretty damn good considering I’ve never run more than a 5K in my life and that was 10+ years ago (not to mention 4 kids ago!). Thanks for the inspiration and wish I was there with you guys!